Biscuits, caramel, bananas, cream… what’s not to like? 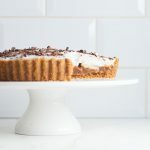 We recently saw a recipe for banoffee pie in the Meat Free Monday cookbook and we instantly knew we had to recreate it for So Vegan. For our recipe we use dates to make the gooey caramel and coconut cream for the light and creamy topping. Always remember the shake test when you buy tinned coconut milk. Give the tin a gentle shake and see if the cream has already set in the tin. If it has, then it should be fine to use. If not, then the cream might not set even when you refrigerate the tin. This is an easy and simple dessert that comes with bags of wow factor. It’s perfect for a dinner party with friends. Place the 2 tins of coconut milk in the fridge so the cream sets at the top. Transfer the dates to a small mixing bowl and cover with hot water straight from the kettle. Leave to one side to soak while you carry out the next steps. Add the dairy-free spread to a saucepan on a low heat until it has melted fully, then carefully pour the melted spread into a food processor along with the hobnobs and 1 tbsp of water. Process until fully combined and the hobnobs have broken down into crumbs. Transfer the base mixture to a 22cm (9″) cake tin that has a removable base. Spread the biscuit base evenly across the bottom and sides of the tin, pressing down into the tin to make sure that it’s compact. It’s important the base is compact, otherwise it might not hold when you remove it from the tin. Then wipe out the food processor ready for the next step. 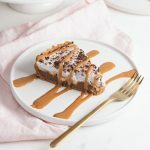 To make the caramel layer, drain the dates, remove the stones and add the dates to the food processor along with the vanilla extract and plant-based milk. Process until smooth. Note, add water (a tbsp at a time) if needed so the caramel is smooth but make sure the caramel doesn’t become too wet or runny. Pour the caramel on top of the biscuit base and smooth it out with a spatula until even. Place the cake tin in the fridge and leave the caramel to set for an hour. After 1 hour, cut the bananas into 0.5cm (1/3 inch) thick slices and arrange them on top of the caramel. Scoop out the cream that has set at the top of the 2 tins of coconut milk and add to a mixing bowl along with the icing sugar. Whisk until fully combined, then pour on top of the slices of banana and gently smooth out with the spatula. 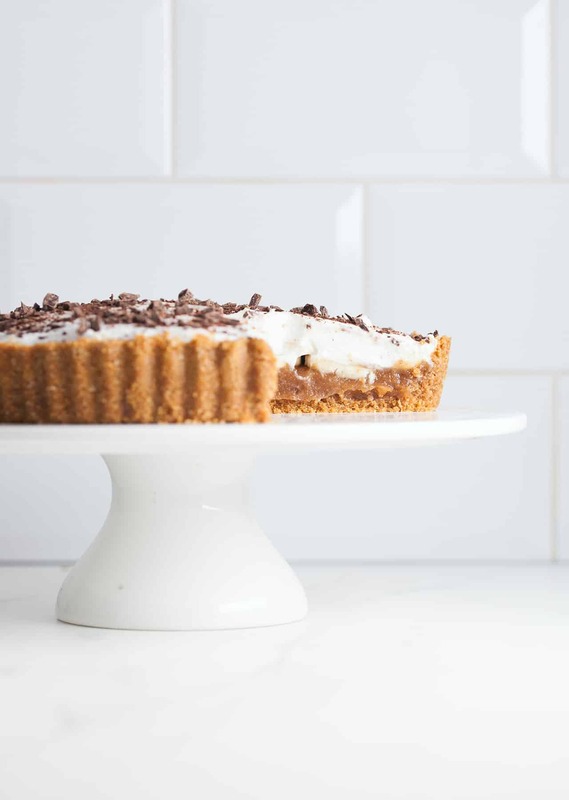 Place the banoffee pie back in the fridge to set for at least 1 hour or until ready to serve. When ready to serve, finely chop the dark chocolate and sprinkle on top of the banoffee pie. If serving with the Biscoff sauce, combine 3 tbsp Biscoff spread with 6 tbsp plant-based milk and stir until the sauce is smooth and runny. 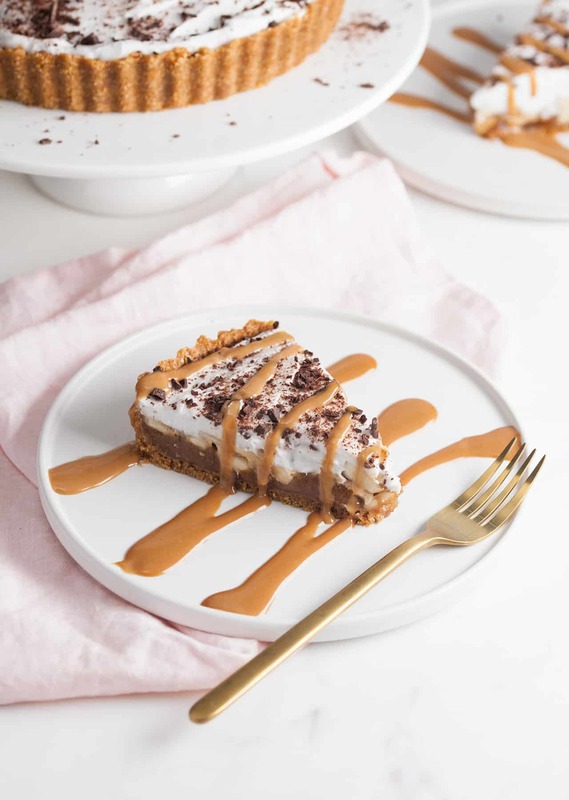 To serve, drizzle some biscoff sauce over each slice of banoffee pie. Keep any leftovers in the fridge. If you leave the banoffee pie out of the fridge for too long, the base might become soggy!